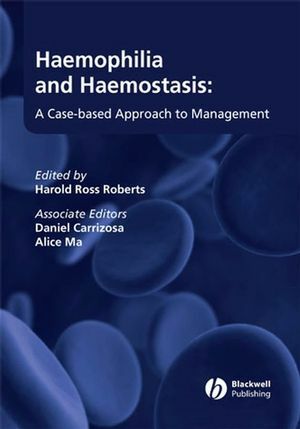 This unique book covers the major cases one might encounter in diagnosing, managing and treating haemophilia. It will provide a practical and informative guide to the broad range of topics concerning both bleeding and clotting disorders. Haemophilia and Haemostasis: A Case-based Approach to Management is divided into major chapter sections by disorder. Each chapter contains questions and cases that were originally submitted to the online Haemostasis-forum (previously Haemophilia-forum). Cases and questions associated with each disorder are presented alongside practical answers from a wide range of international contributors. Whether you are a practising clinician or trainee in haematology, working in the fields of coagulation, haemostasis or thrombosis, or any other health care professional working in a haemophilia centre, this book will provide practical clinical answers to aid in your day to day patient care. Harold Roberts, MD, ex-Senior Associate Editor of the Journal of Thrombosis and Haemostasis and Chairman, Division of Hematology/Oncology, University of North Carolina at Chapel Hill, Chapel Hill North Carolina, USA. Dr Roberts, a Sarah Graham Kenan Professor of Medicine and Pathology at the UNC-Chapel Hill School of Medicine, was born in Four Oaks and grew up in Sanford. He earned his undergraduate and medical degrees from UNC-Chapel Hill, joined the faculty in 1962 and has served as chief of the division of hematology and director of the UNC-Chapel Hill Comprehensive Hemophilia Diagnostic and Treatment Center. He was also the founding director of the school's Center for Thrombosis and Hemostasis, which conducts research on blood clotting disorders related to cardiovascular disease and on bleeding disorders such as hemophilia. He has served on the editorial boards of Current Opinion in Hematology and Hematologic Pathology, as well as being senior associate editor of Thrombosis and Haemostasis. Excellence in laboratory research and patient care earned Dr. Roberts numerous awards: the French International Prize for Research on Hemophilia, the National Hemophilia Foundation's Kenneth M. Brinkhous Award for Excellence in Clinical Research, and the Robert P. Grant Medal, the highest honor given by the International Society on Thrombosis and Haemostasis. The citation accompanying this award lauded him as "one of the pioneers in the field of coagulation as well as being a leader in the Chapel Hill group which has brought so much to our present understanding of the subtleties in the mechanisms of coagulation. His contributions to our field have had a major impact, especially his outstanding work on the genetic basis of hemophilia." In spring of 2000, Dr. Roberts received the UNC Medical Alumni Association's Distinguished Faculty Award and an honorary doctor of medicine degree from Lund University in Sweden. Daniel Carrizosa, MD, Consultant Hematologist, Division of Hematology/Oncology, University of North Carolina at Chapel Hill, Chapel Hill North Carolina, USA. Alice Ma, MD, Division of Hematology/Oncology, University of North Carolina at Chapel Hill, Chapel Hill North Carolina, USA. List of Haemostasis Forum Editors. 1 Hemophilia A and Hemophilia B.
Hemophilia and Immune Tolerance Therapy. The Hemophilic Ankle: An update. The Hemophilic Knee: An update. Combined Hemophilia A and B Carrier. A Complex Case of Hemophilia with HIV and Hepatitis C.
A Case of Hemophilia B, Mild VWD and a Factor IX Inhibitor. Premature Infant with Hemophilia B. Treatment of the Pregnant Hemophiliac. Anticoagulation for Atrial Fibrillation in a Hemophiliac. Anticoagulation for a Cardiac Valve in a Hemophiliac. Cardiac Catheterization in a Hemophiliac. Anticoagulation for a DVT in a Hemophiliac. DDAVP for Treatment of Mild Hemophilia during Surgery. Hemophilia and Hepatitis C Treatment. Hemophilia and Ventricular Septal Defect Repair. Hemophilia with Hepatitis C and Recurrent Bleeding. Laser Eye Surgery in a Hemophiliac. Continuous NovoSeven: Pros and Cons. Hemophilia B and Immune Tolerance with Anaphylaxis. Thrombosis in Prothrombin Complex Concentrates (PCCs) vs. activated Prothrombin Complex Concentrates (APCCs). 2 Von Willebrand Disease (VWD). Anticoagulation for a Cardiac Valve in a patient with VWD type 1. VWD type 2a and Pregnancy. VWD type 2b and Pregnancy. VWD type 2b Versus Platelet Type. Prophylaxis in VWD type 3. Combined Factor V and VIII Deficiency. DVT Prophylaxis in FVII Deficiency. Menorrhagia in Factor VII Deficiency. Anticoagulation for Atrial Fibrillation in FX Deficiency. Management of Factor X Deficiency. Anticoagulation for Atrial Fibrillation in a patient with Factor XI Deficiency. Factor XI Deficiency and Surgery. Prophylaxis for Patients with Factor XIII Deficiency and Intracranial Bleeding. 4 Rare Platelet and Coagulation Disorders. Hereditary Vitamin K Dependent Coagulation Factors Deficiency and Pregnancy. Glanzmann’s Thrombasthenia and Gastrointestinal Angiodysplasia. Acquired Hemophilia and Second Pregnancy. Developing a Factor IX Inhibitor. End-Stage Liver Disease and Surgery. The Use of the INR. Selective Serotonin Reuptake Inhibitors and Clotting Disturbances. Work-up for Children with Intracranial Bleeding. Are Asians genetically different from Westerners when it comes to VTE?. Pediatric Antiphospholipid Syndrome and Recurrent Thrombosis. Anticoagulation for Deep Venous Thrombosis in the Presence of an Intracranial Hemorrhage. Clinical Probability Assessment for Thromboembolic Disease.